This site contains WFPL news reports from 2008 to May 30th, 2012. Please visit wfpl.org for current reports. A lawsuit filed today in federal court alleges a black substance coating the homes of residents in some areas of Louisville is caused by whiskey distilling. Attorney Bill McMurray says for years, residents have seen a black substance growing on metal surfaces, and it’s nearly impossible to remove. “And it’s only recently been understood within the last couple of years what the actual cause for that blackening is, and it’s this particular fungus,” he said. Louisville author Patrick Wensink has discovered one simple strategy to help people pay attention during book tour readings. He’s made a drinking game out of his. Wensink hands out a list of six words before he reads an excerpt from his new novel. Every time he reads one of the key words, everyone (author included) takes a sip. “I did a reading last month in Portland and I finished two and a half beers in, what, ten minutes? Fifteen minutes, maybe, depending on how fast I read? I suffer for my art, I guess,” he says. Indiana officials are advertising for bids for preparatory work on the state‘s portion of the Ohio River Bridges Project. Indiana Department of Transportation spokesman Will Wingfield says construction will begin this summer on a road extension between Utica, Indiana and the River Ridge Commerce Center. It’s the first step toward construction of a new east end bridge. “We anticipate with bids opening July 11 that we’ll be breaking ground about August in terms of beginning work there. The road extension would open about June, 2013, and obviously we still have the larger procurement for the east end bridge that will be ongoing at that time,” Wingfield said today. Wingfield says officials hope to have the east end bridge finished by 2018, if not sooner. Kentucky officials are working with potential contractors on the larger portion of the bridges project, construction of a span in downtown Louisville and the reconfiguration of Spaghetti Junction. 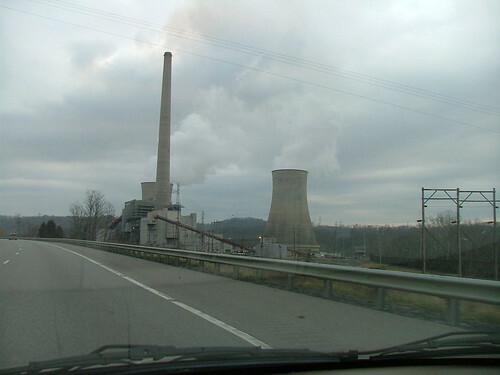 American Electric Power may have changed its mind about the future of the coal-fired Big Sandy Power Plant in Eastern Kentucky. The company has an application pending with the Kentucky Public Service Commission to install pollution controls at the plant to continue burning coal. But WFPL has learned that AEP filed to withdraw the application today. Now, instead of moving ahead with the retrofit of the Big Sandy plant, the company plans to re-evaluate alternatives to comply with upcoming air pollution standards. Earthjustice attorney Shannon Fisk represented environmental groups that intervened in the case, arguing that it would be more cost-effective to replace the plant’s capacity with a mix of other natural gas, renewable energy and efficiency measures. Fisk called AEP’s application withdrawal a victory for both the environment and ratepayers, and said it’s a move that he hopes will be noticed around the country. Lieutenant Governor Jerry Abramson and Kentucky’s Blue Ribbon Tax Commission are seeking public comment to help develop recommendations on overhauling the state tax code. Abramson says around 100 people attended the first of six regional public hearings last night in Paducah. The commission wraps up public meetings in August and will have three months to finish the plan by a November deadline. Abramson is hopeful the plan will pass the legislature. “I’m sure there will be people that will disagree with whatever the consensus decision recommendations are from this blue ribbon group. But, you need a majority. The hope is that we’ll be able to with democratic and republican legislators on the commission that they that they will help us with their respective caucuses to move the proposals forward,” he said. With the plan complete before Thanksgiving, the governor could call a special session to pass the recommendation, which would only require a simple majority of votes in each chamber. If Gov. Beshear waits until the next legislative session in January it would take a super majority in each chamber to pass the legislation. U.S. Sen. Rand Paul, R-Ky., plans to introduce legislation to cut all aid to Pakistan until the foreign country releases a physician who assisted the U.S. in killing Osama bin Laden. According to reports, Dr. Shakil Afridi worked with U.S. intelligence officials to run a number of a fake hepatitis B vaccine programs in order to prove the terrorist leader lived in the Abbottabad compound. Last week, a Pakistani court sentenced Afridi to 33 years in prison for treason under tribal law. Louisville Mayor Greg Fischer has put together a special team that will take on five urban challenges. The projects range from to expanding recycling and reducing the number of low-severity 911 calls to implementing a more efficient rezoning process. Fischer announced a six-member “Innovation Delivery Team” will deal with the five goals, which will be funded by a $4.8 million grant from Bloomberg Philanthropies that the city received last year. Fischer says the hope is to bring breakthrough ideas to Metro Government, such as new ways to reduce the number of vacant and abandoned properties. U.S. Rep. John Yarmuth, D-Ky., will host the third annual “Build Your Skills” workshop next month at Jefferson Community and Technical College’s downtown campus. The event is hosted in conjunction with KentuckianaWorks, the Louisville Urban League and Metropolitan College, and is free and open to residents. Yarmuth says Louisville residents who are unemployed, underemployed or looking to change their careers are invited to attend, where they can receive professional advice on resume writing, job-hunting, and interviewing. The workshop is scheduled for June 15 and will be from 9 a.m. to Noon. Check-in for the event begins at 8 a.m., for more information call 502-582-5129. A national progressive organization that’s pressuring Democrats to drop their memberships in a conservative nonprofit is now operating in Kentucky. The Progressive Change Campaign Committee has spearheaded several national campaigns, like the push to recall Wisconsin Republican Governor Scott Walker and with Massachusetts Democrat Elizabeth Warren’s U.S. Senate bid. The group is also encouraging lawmakers to leave the American Legislative Exchange Council, or ALEC. ALEC helps draft and pass state legislation, and the group has come under fire recently for its involvement in Florida’s controversial “Stand your ground” law.